Ezekiel 47:15-20 These are the boundaries of the land: The northern border will run from the Mediterranean toward Hethlon, then on through Lebo-hamath to Zedad; then it will run to Berothah and Sibraim, which are on the border between Damascus and Hamath, and finally to Hazer-hatticon, on the border of Hauran. So the northern border will run from the Mediterranean to Hazar-enan, on the border between Hamath to the north and Damascus to the south. 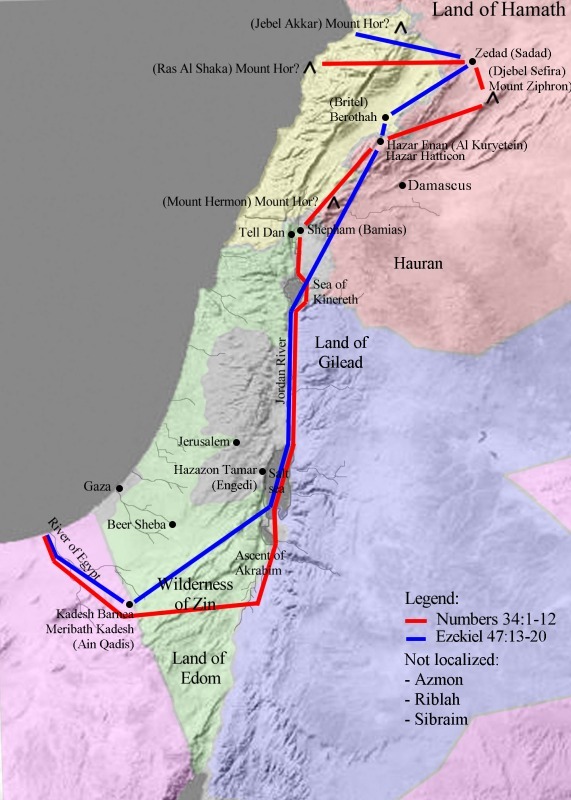 The eastern border starts at a point between Hauran and Damascus and runs south along the Jordan River between Israel and Gilead, past the Dead Sea and as far south as Tamar. This will be the eastern border. The southern border will go west from Tamar to the waters of Meribah at Kadesh and then follow the course of the Brook of Egypt to the Mediterranean. This will be the southern border. On the west side, the Mediterranean itself will be your border from the southern border to the point where the northern border begins, opposite Lebo-hamath.